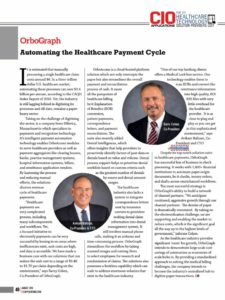 Healthcare costs are skyrocketing and paper remains an obstacle to electronification — but, even with all that, the August CIO Applications publication (see electronic versions here) highlighted OrboGraph as a Top 25 Healthcare Technology Solution Provider for 2017! The magazine highlighted the OrboAccess cloud-hosted platform solution, which not only intercepts the paper but also streamlines the overall payment and reconciliation process of cash. It eases all the pain points of healthcare billing including Explanation of Benefits (EOB) conversion, patient payments, correspondence letters, payment reconciliation and denied claim analytics. Thank you, CIO Applications — and rest assured OrboGraph will keep moving forward to bring further innovations to healthcare tech!